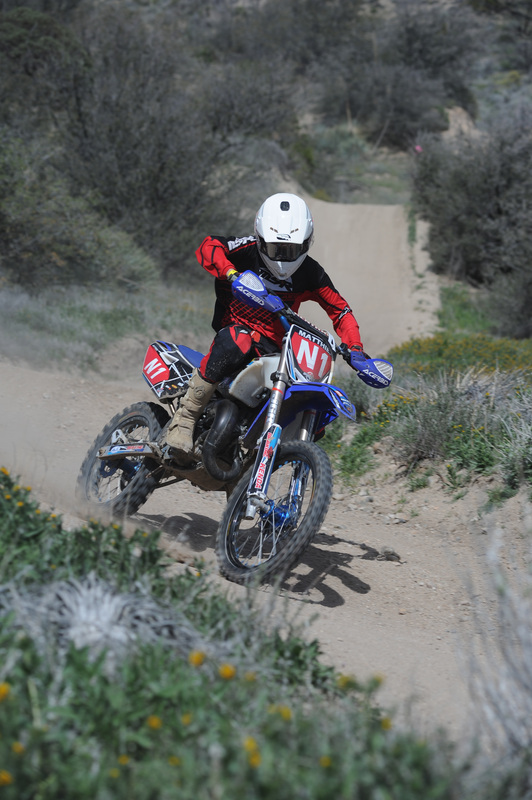 Gorman, Ca: Round 3 of the Kenda/SRT West Hare Scramble Championship marked the first trek to Southern California’s AMA District 37 for the Hungry Valley Hare Scramble hosted by Prospectors MC. Purvines Racing’s Nick Burson was the odds on favorite as almost every time he races in Gorman he takes the win in dominating fashion. “I’ve raced and ridden here a lot. Used to test motorcycles and UTV’s here a few years back so I’ve spent lots of time out here.” He would prove that to be true before the end of the weekend but first the Youth classes would take to the course. 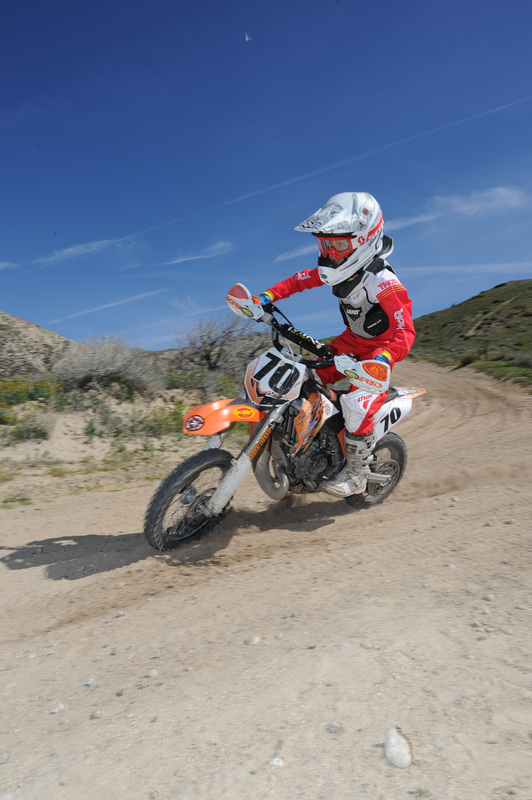 Saturday would start with the youngest racers in off-road – the Pee Wees. Pax Racing’s Tyler Kipp and LGMC’s Elizabeth Edwards would hook up off the first lap trading positions what seemed like every corner. Even trading paint coming out of the over/under as the 2 riders came together in the corner. They would finish 1 second apart with Kipp holding on to the lead ahead of Edwards with High Desert Cycle’s Aiden Storovich a full lap behind the battle in 3rd. Edwards now has a firm grasp on the points lead. The next race on the line would be the Girls, Junior Girls and Micro Minis. Into the first corner it was TBT backed Lane Forbes and FMF/DIT/Mika backed Talan Van Valkenburg aboard their KTM 65s. Van Valkenburg would take over before they exited the MX track onto the 6 mile hard packed course through the mountains. He would run a flawless race and take the overall win by over 6 minutes with Forbes in 2nd followed by first time WHS racer Chase Reid from Lamas, WA. Six Five-0 Racing’s Ava Silvestri would take the early lead in the girls class and never look back. She would lap the entire class taking the win and 4th overall in her first race after recovering from a broken wrist. Kenda backed Bailey Rhodes would follow in 2nd making her second podium in a row followed by T.O.R.A’s Macie Kulikov who now holds the Girls points lead. Kristine Kipp would go on to take the Jr. Girls win on the day. The final youth race of the day would see the fastest kids on the line – Big Wheel, Mini and Jr. Mini. Six Five-0 Racing’s Mateo Oliveira has been on fire so far this season with 2 wins in a row, but both up north. Now being in the south it opens it up to the racers who prefer the open terrain, one being the 2015 Mini class champion Mason Matthies. Now bumping up to the Big Wheel class aboard his Thousand Oaks Powersports backed YZ 85 he has been itching for some faster terrain. Off the start he would immediately take control getting over the first set of table tops on the MX track just ahead of Oliveira. The two would stay nose to tail for 9 of the 10 laps in the hour and a half race. Just behind them another Yamaha/KTM battle was brewing with Fasst Co’s Cody Kurtz staying seconds ahead of 707 Suspension’s Logan McChesney. The two would also stay seconds apart all the way to the checkered flag. Matthies would it on the 5th lap after retaking the lead from Oliveira and would drop back close to 45 seconds. The next lap Oliveira would pit and as he exited Matthies would squeak in front once again. On the final lap Oliveira’s bike would stop handing the win to Matthies along with Kurtz who would get back past McChesney for 2nd after splash of gas on the final lap. McChesney now holds the points lead by 2 over Oliveira with Matthies another 10 points back after a rough start to the season. T.O.R.A backed Wyatt Kulikov took his 2nd Mini win of the season but was a bit off pace finishing 11th overall. He had control of the points championship with 2 win’s in a row. 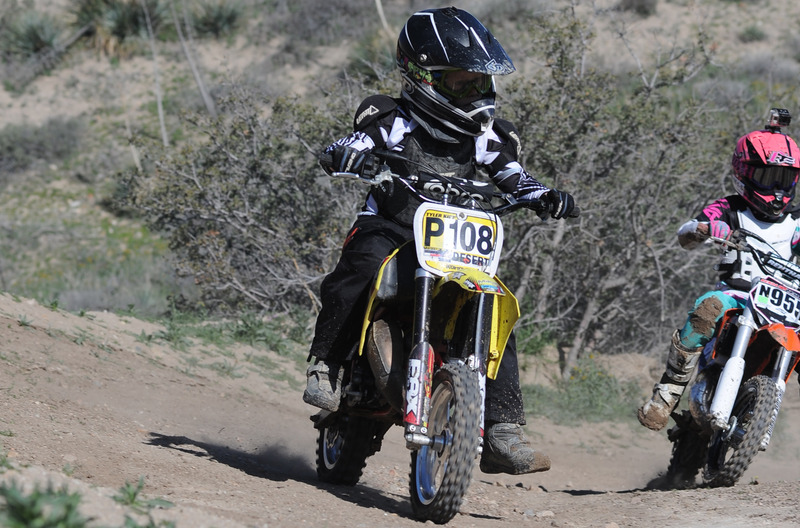 Motocross Direct Husqvarna rider Evan Slosser went 3 for 3 in the Jr. Mini class along with taking 4th overall on the day. He had a close call jumping off the course into the bushes but would pull it off to finish ahead of So Cal MC’s Carter Klein and FMF’s Seth Sadorra. The last race of the day would also be Round 3 of the brand new West ATV Championship comprised of 4 National Hare and Hounds and 4 West Hare Scrambles. At the green flag it was Rovers MC’s Mark May into the first corner but before they left the track it was series points leader Colt Brinkerhoff aboard his Back to the Future themed Amoil/Fasst Co/Hinson backed Honda. He would run away from the field even with injection issues. 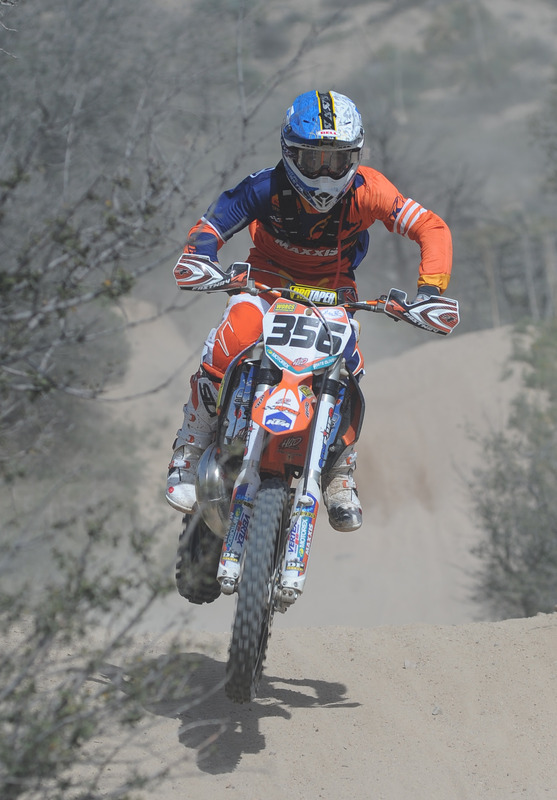 Carson Motorsports KTM’s Howard Tande would be the only other ATV to stay on the lead lap taking 2nd overall and the ATV B victory. 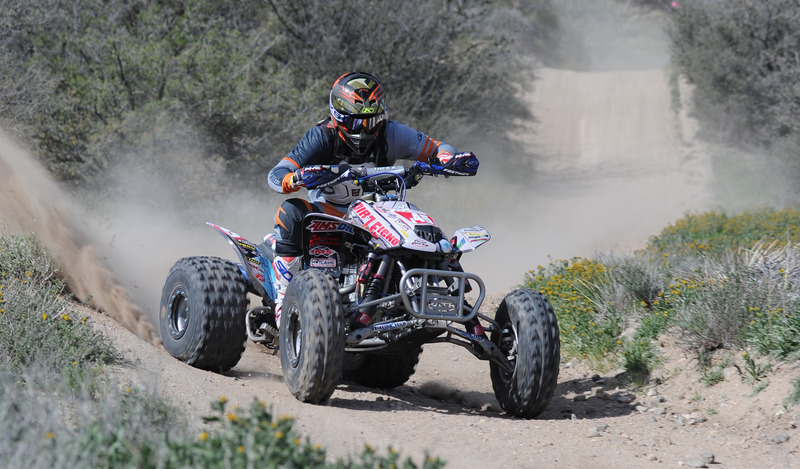 Accelerated Funding backed Rachel Bosemer would battle back from a dead last start to take 3rd Overall and the ATV A victory. After a good night of sleep, a few course changes and another 6 miles added on to the course Race 1 was ready to get underway! The Women would be the first ones to hit the track and Garrahan Off-Road Training’s Sophia Oliveira was off the a great start. With a 2nd and a 1st leading into Round 3, and a win here in 2015, she had all the confidence she needed to take the win. Team SRT’s Sharon Mowell would stick just behind Oliveira as they left the track but would lose touch of her in the off-road section. Anna Cody would come out to race for the first time in a while to take 3rd Women A.Oliveira would be the first Women’s A into the finish on lap 1 earning herself $50 from 3 Brothers KTM. Kyleigh Rhodes would take the Women’s B and Courtney Feldman would take the Women’s C award! The Overall for race 1 would come down to seconds! 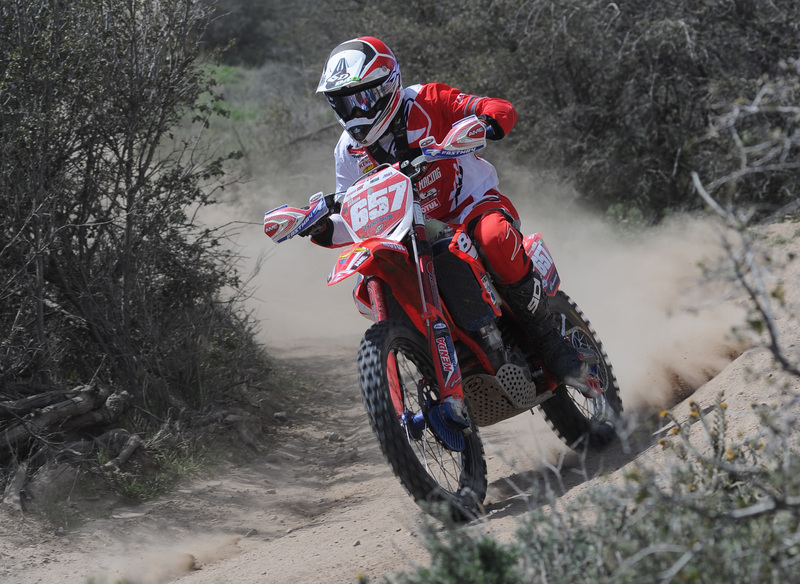 While Oliveira was out front there was lots of battling going on behind her. With the series being on adjusted time you never know who might take the overall and it all comes down to the clock. Finishing physically in 2nd but close enough to take the victory by 26 seconds from row 2 would be Laytonville, CA’s Shelby Ford. Oliveira would take 2nd overall followed by Sam Capt another 26 seconds back. At the end of a long weekend the big race was finally lined up. With 138 racers on the line, 17 pros and 7 Pro 250’s it was going to be a great race to watch to be sure! Into the first corner AMRA AA Points Leader Ryan Kudla shot his 3 Bro’s KTM to the front of the field. “I had actually lined up right next to [Nick] Burson and we joked that I could just push everyone wide and make a hole for him… that’s kind of what happened.” He would drop to 6th by the time the left the MX track and after a handful of shuffles and battles he would finish 6th overall, his best WHS finish to date. Burson would take control of the event very quickly and by the end of the first lap would pull 20+ seconds a lap on 2014 Series Champion Factory Husqvarna’s Jacob Argubright who held onto 2nd for the first 2 laps. He would take a tumble passing a lapped rider cracking his clutch cover dropping to 17th overall by the finish. Very uneventfully Burson would go on to take a dominating win by nearly three and a half minutes over the next competitor giving him the points lead for the first time this season. Team SRT’s Cory Graffunder would adopt 2nd after Percision Concepts Justin Morgan would get sidelined with electrical issues. He would tow along RPM/KTM’s Travis Coy into the battle for the podium. Graffunder would stretch it out a little bit taking a comfortable 2nd overall, making for his best finish of the season followed by Coy who would also take his best finish of the 2016 season. Purvines Racings Axel Pearson would get 4th overall followed by SRT’s Alex Dorsey who would battle back from 12th to wrap up the top 5. 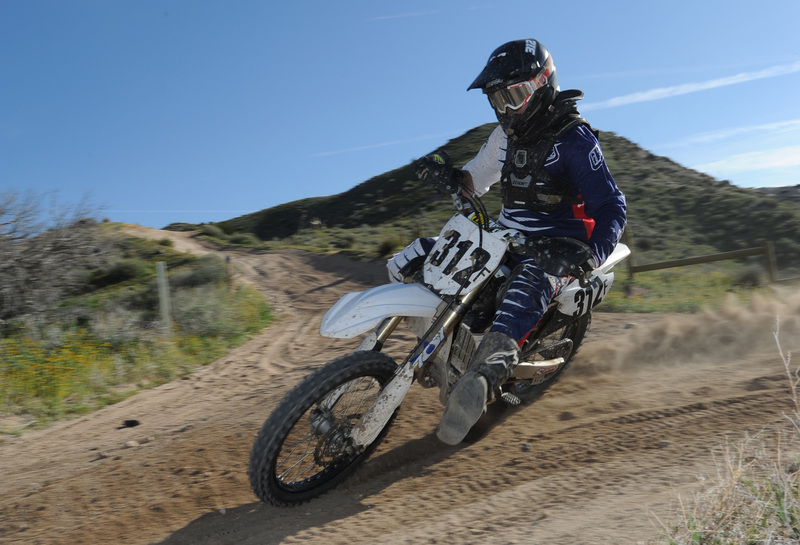 The Pro 250 class has also had it’s battles all season and this weekend was no different. FMF/Maxxis/RPM backed Dante Oliveira seemed to have it all under control on the first lap but by lap 3 El Cajon, CA’s Dustin Mccarthy would get by him but by lap 4 Oliveira was back in control and on his way to his 2nd class win of the season. McCarthy would stay in 2nd followed by 707 Suspensions Max Parker. We also had professional Stunt Man Logan Holladay from films such as Inception, Iron Man 2, Terminator 4, GI Joe and more. He ran as high as 8th overall before running out of gas on the final lap.